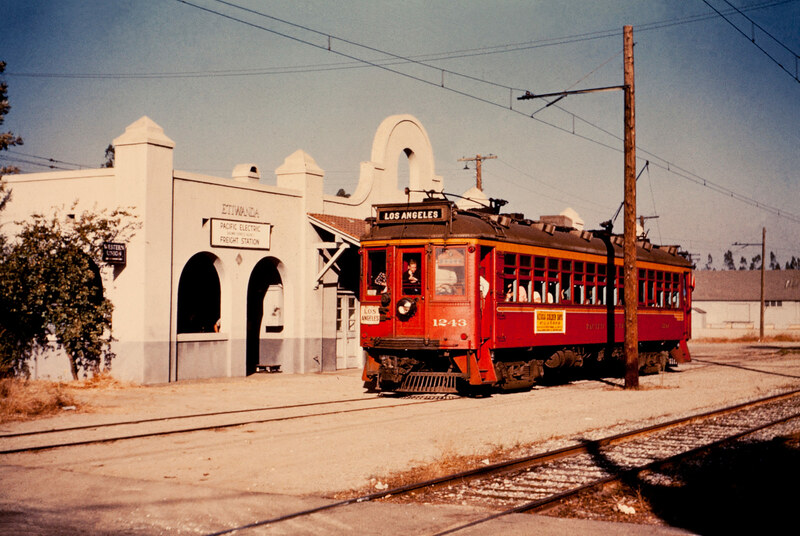 It’s October 1950 and Pacific Electric no. 1243 is stopped at the Etiwanda Station as part of a railfan trip. This fan trip was one of the last for a 1200 on the San Berdo line. I think only #1299 made one more fan trip over the line. 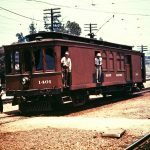 The #1243 was a Long Beach 12, built as a trailer, but was “motorized” with the electrical gear from #1209 that was badly damaged in a grade crossing accident with a gasoline truck during WW2. So, #1243 was a San Berdo 12, in a Long Beach 12 clothing. I like the colorful paint scheme. But where is the “butterfly wings” that’s supposed to be on the car ends? This is probably it, Robert. To get a color shot of it was insanely lucky – usually you see Etiwanda in BW only.